at first i could not put my finger on why the spanish architect rafael moneo’s design had this effect on me - but somehow, once inside the building, i immediately felt transported to somewhere outside the country; outside sweden; outside the realm of the swedish architecture world. like stepping inside the embassy of some foreign nation, and suddenly finding oneself to be - in legal terms - no longer on swedish soil: a place where swedish “architectural law” did not apply: it was as if i no longer was in stockholm. to get to the permanent collection exhibit, one had little choice but to start walking, and continue walking, down a very long and wide corridor: a corridor of epic proportions, one might say: more corridor than most other corridors. a corridor filled with very much, distilled, pure “corridor-ness” if you like (main corridor marked pink in floor plan above - click on image for larger size floor plan). if there is such a thing as a swedish national character, it has been suggested that this character consists of, well not being cheap/stingy/miserly/mean about money per se (i.e. not any absolute unwillingness to spend one’s money per se), but rather a strong sense of economy and housekeeping. resources have always been scarce up north, days and summers are short, winters long and cold. one makes the most of everything one has just to survive. so it is very “foreign” to us northerners to not use a long corridor wall in a museum for exhibiting art. and there you have it, the feature which made this building immediately feel so foreign to me: the relative “uselessness” of the main corridor. such a dramatic, elongated space felt “foreign,” especially for its programmatic emptiness - an emptiness which of course served the purpose to accentuate and heighten the effect of the innate contrast between the building’s monumental aspect (the “empty” main corridor) and its intimate aspect (its labyrinth of smallish, boxlike exhibition spaces, “filled” with artworks). but such a “foreign” (catholic?) esprit never survives for long up here in the north. the drive to always make as much “use” of everything is too strong. and sure enough: it did not take long before the museum’s directors and curators started polluting and corrupting the corridor’s original concept of spacial purity/purism. today, ten years later, the veneer paneling is long since gone. the corridor walls are painted white. and plenty of artworks are now on show: conventional paintings in conventional frames, lit conventionally by spotlights. as well as a big section of andy warhol’s “cow” wallpaper, of course. and some freestanding sculpture here and there. but more importantly - exhibiting a few art pieces was never enough to make everyone feel that proper “use” had been made of the corridor. thus specially designed furniture (to sit on), specially designed magazine racks (to provide reading material to the people who choose to have a sit-down on the specially designed furniture), and new extravagant reading lamps hovering over the specially designed furniture (to provide light for the people who have grabbed some reading material from the magazine racks and have sat themselves down to have a bit of a read) were placed along the full distance of the corridor, all the way, from start to finish. ironically: it is very uncomfortable to remain seated on the specially designed furniture for any length of time - to read something, for instance. one might occasionally see somebody sit for a minute or so, but one never - never! - sees anyone sit and read. but this fact seems to be of little consequence: the uselessness (!) of all that new furniture seems to be less of a concern to the people in charge than the “uselessness” of an “empty” corridor. making the corridor look useful seems more important than to actually, really, “make use” of it. it’s as if all that clutter of added-on-to furniture is less about providing an opportunity for the museum’s visitors to sit down, but instead all about protecting the museum’s visitors from the experience of pure, “useless” space. there you have it: it’s a big “cover-up,” folks. the furniture and magazines and lamps serve to cover up, to hide away from sight the original “uselessness” which the architect had intended for this space. the main architectural feature of the museum has disappeared completely over the years: its main corridor’s purity of space has become more and more cluttered up. today nothing of that original “foreign embassy” quality remains. none of the original “edginess” remains (if one can ever speak of any “edge” in any of the architecture of rafael moneo’s - moneo is certainly not “edgy”). it is ironic how an “un-edgy” architect like moneo (the architectural finishing of floors and doorways and everything else in the museum is much, much too “soft” for my personal taste. as a whole i am in fact not at all a fan of moneo’s stockholm museum) managed to spook everyone by instilling into his building the greatest, the “edgiest” provocation imaginable for a museum in stockholm, sweden: the idea of space as “pure” space: the exhilarating luxury (?) of allowing oneself to experience space as “just” space, pure and simple, every now and then. 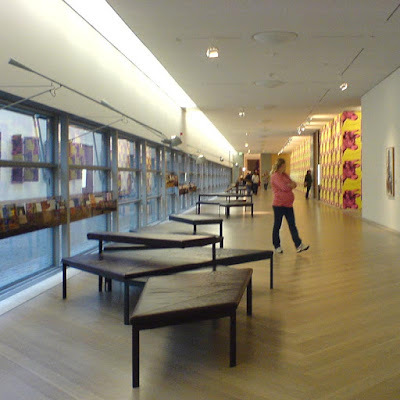 however: deciding to clutter up the main corridor of “moderna museet” with all that furniture etc. was not just architecture’s loss. also art lost out. i would argue that making “better use” of the long, stark, (in a good way) monotone corridor - such as exhibiting even more of what is already exhibited everywhere else in the building - dilutes the effect of not just the architecture on the visitor, but the effect of the art as well. sure, more (a greater number of) artworks can be put on display, but the actual effect of this is the opposite of (the expected?) heightened art experience. the corridor’s spacial impact (what’s left of it) competes too much for the attention of the museum’s visitors to make the corridor a really good space for exhibiting and experiencing art. simultaneously the art on show in the corridor causes a diluting effect on the impact of art on show everywhere else in the building. but if there is no profit to be gained from messing up the corridor, neither for architecture buffs, nor for art buffs - what is the payoff? why perpetuate behavior without payoff? because it’s in our nature; it’s in our national character to just not be able to leave architecture alone (“klåfingrighet”). it’s contrary to everything we profoundly are and feel to let architecture be, well, architectural. if the question would be put to me “what constitutes swedish-ness in architecture?” i would go for: the constant strive - on the level of a national, collective neurosis - to always compromise and pollute it (“fasa av, trappa ned, lägga till”); to always insist on turning every piece of fine architecture into non-architecture. this always happens here, mostly sooner rather than later, sometimes later rather than sooner, but eventually it always happens.